When an elite squad of pumpkin-snatching goblins shows up at your house, they usually make off with your pumpkins before you realize it. That way, you can blame teenagers and don’t have to consider the fact that goblins exist. 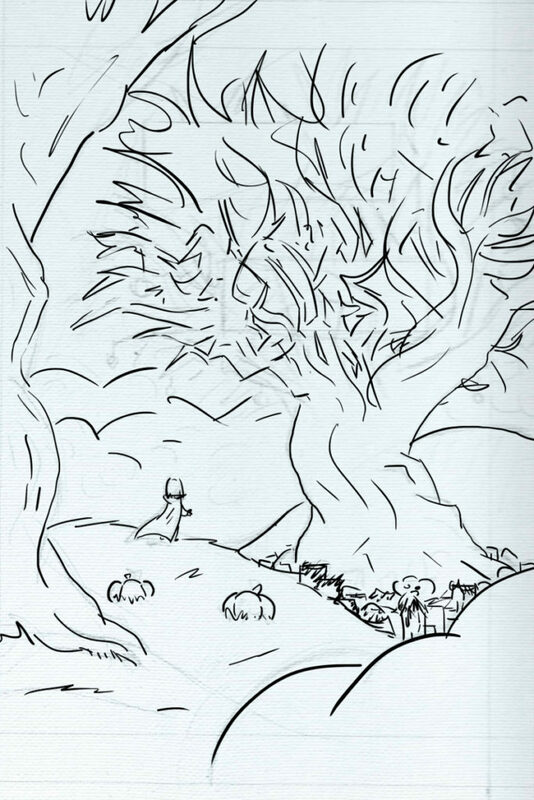 This is the second preview of my upcoming middle-grade chapter book, Pumpkin Goblins. And the scene I read here is one of my absolute favorites. In it, Amber finds herself face-to-face with the three goblins who tried to steal her pumpkin. One of the first pieces of this story I wrote was the bit of dialogue in which the goblins think she’s named Ember (like fires), rather than Amber (like dead bugs that were fossilized a million years ago). There’s a story behind that. Originally, Amber’s name was Ember. I think I had Elfquest on the brain, but it also seemed like a cool name, one that went with jack-o-lanterns and spooky forests. The problem with cool names? They set off Mary Sue alerts in my head. And since Amber is definitely not a Mary Sue, I thought it would be better to give her a “normal” name. Changing one letter was an incredibly time-efficient way to do this. But it works on another level too: my best friend growing up was named Amber. We usually played outdoors and sometimes went on adventures, so I think Amber is a fitting namesake*. Amber glared at the goblins. Suddenly, the third goblin, the one with the sunglasses and fingerless gloves, the one who had spoken least, jumped up off the small garden rock she had been squatting on and waved the other two goblins into a huddle. They talked rapidly for a moment in language that was both higher and lovelier than Amber had expected, then turned again to face her. “We have decided. You may come with us to the Goblin Oak and place the pumpkin there yourself,” announced the leader. We’re a little over two weeks from the aimed-for release of Pumpkin Goblins. In between frantic editing and formatting, having a job, and enjoying fall, I’m planning to put out at least one more of these preview scenes, and also a recipe for goblin candy. *Apparently, “namesake” can refer to both the person one is named after, and the one who received the name. No wonder that always confused me. You should figure that if a group of sneaky Halloween goblins gives you a map to anywhere, there’s going to be something tricky about it. This is the first preview of my upcoming middle-grade chapter book Pumpkin Goblins. It’s a Halloween adventure story. In the scene I read here, my main character, Amber, finds herself in goblin jail after an incident with a goblin map. I’ve seen other authors post audio of themselves reading their work, and I enjoyed it. This is despite the fact that I’m not patient enough to listen to an entire audio book. Shoving aside my introverted tendencies and my Massachusetts accent*, I decided to do the same. Hi, I’m Kris Bowser, the author of Pumpkin Goblins. My main character, Amber, is having the worst Halloween ever. This scene is the predicament she finds herself in after some trouble with a magic goblin map. Amber sat in a jail cell that had been carved from an enormous pumpkin, and smelled like it. She knew she should be afraid, but couldn’t shake the feeling that it was time to mark out a face on a would-be jack-o-lantern, and that toasted pumpkin seeds would be coming out of the oven soon. The cell had bars that looked like twisted, ropy wood, but held firm like iron. Maybe she should be scared of never getting free, but pumpkin jail was at least not so boring as spending the evening watching Dean and Sybil play video games. A soft, quick noise came from the tiny window high on the cell’s outer wall. Clinging to the window bars, forearms tight to hold himself up, was the leader of the three goblins who had come to her house. Finally, some answers. She heard the thunk sound of a goblin kicking the outside of pumpkin jail in frustration. The two goblin fists released the bars, and he dropped out of sight. The cover art is still in the early stages. Can you image how awesome and Halloweeny this is going to look when there are colors? Stay tuned for more preview scenes from Pumpkin Goblins! Halloween is coming. *Honestly, my accent isn’t heavy anyway, and I’d rather have a Massachusetts accent than vocal fry, which I learned about while googling things like elocution and audio recording software. I actually tried speaking with a vocal fry after watching the videos. It’s uncomfortable. To me, blackout poetry represents an opportunity to make mischief out of boring things like financial columns and interviews with Arnold Schwarzenegger. You excise the dull parts with swaths of ink or paint. It’s like a secret code created with gleeful defacement. You can see how I made a “rough draft” in pencil, but then couldn’t erase it because that would’ve effectively murdered the newsprint. Poetry, in general, isn’t something I write. 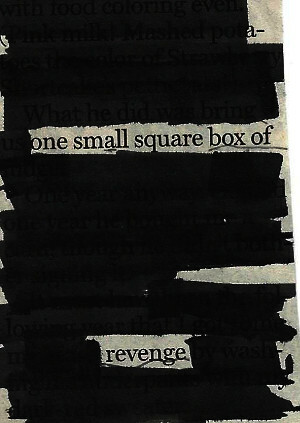 But I can never resist mischief (or trickery, or sneakiness*), and apparently I created a lot of blackout poetry a few years ago. 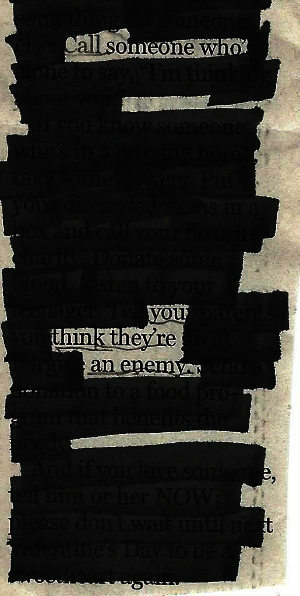 I posted another blackout poem over a year ago. I found these few poems while looking through an old art journal, and had one of those “Oh, cool!” moments that come around sometimes when looking through old things you’ve forgotten about. Or even things that aren’t so old. If you write enough, there’s a point when your brain can’t hold it all in, and blog posts from maybe two months ago read like new. If I twist my brain hard enough, I can justify this as being actual advice. Of some sort. I imagine it’s wrapped in elegant paper the color of titanium. 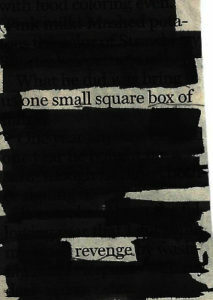 And the idea of a small, square box of revenge, whatever that is, amused me. *Despite the fine distinctions between trickery, sneakiness, and mischief, I have tags for both sneakiness and trickery, and most of the posts overlap. Speaking of sneakiness, I just learned I’m the top Google result for “Kris Bowser sneaking food into movie.” For reasons.. I set out to troubleshoot my perfectionist blogging process and instead discovered the quantum nature of writing. 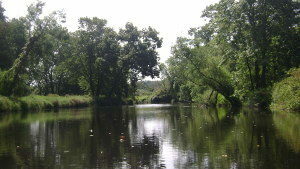 While I enjoy blogging, I have difficulty posting often. My problem is that blogging is something of a struggle for me, in the way that climbing Mount Doom in a state of extreme dehydration with the weight of intense evil around your neck is something of a struggle. I wanted to figure out a way to minimize the struggle, blog faster, and still enjoy myself. When I started this blog, I assumed that coming up with ideas would be tough. I bought Show Your Work by Austin Kleon and Rise of the Machines by Kristen Lamb, which both discuss coming up with ideas for blog posts. Both books are helpful, both are written in a friendly manner that makes regular blogging seem less intimidating, and both aided me in coming up with post ideas. But post ideas weren’t what I needed. Turns out, I have no shortage of ideas: there are over four dozen unfinished posts in the Scrivener project for my blog, and that’s not even counting posts still in the idea stage. Perfectionism is a constant problem for me, but I’m also capable of writing very fast*. What ends up happening is that I’ll get down several hundred words of a blog post in fifteen minutes or so, but then I become mired in doubt while attempting to actually finish it. Or, I might set out to write a quick post about a haircutting youtube video I found helpful, but then I end up writing a treatise on everything I know about haircutting. This is where the Mount Doom analogy comes in. 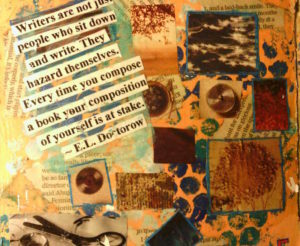 Writers are junkies for analogies about writing. Even that last sentence verged on analogy, because I didn’t mean “junkies” in the literal sense. Blogging requires the opposite of what I’ve been doing: frequency, speed, and often brevity. If you want your site to have good SEO (search engine optimization), you need to post often. Blogging is fast. A blog post can do the same things any piece of writing can: inform, persuade, entertain, or tell a story. But it can also function as social media, open a dialogue, or pass on something interesting from another site. It’s ok to share something (such as the haircutting video) and start a conversation without making a post an exhaustive monument about everything concerning that topic. I read and enjoy plenty of blogs that do this, and many blog posts tend to be shortish. I do read some blogs with posts regularly going over 1000 (and maybe even 2000 words), but I aim to write 300-700 words because that’s the length I enjoy reading most. It’s short enough to be a quick read, but long enough to expand upon a topic. I’ve tried a lot of strategies to finish blog posts faster. Timeboxing was one, and I made a flowchart last year to accompany my brand new timeboxed blogging method. After spending an unnecessary amount of time choosing color schemes and type faces for this flowchart, and in the process re-encountering my old nemesis Procrastination (he has a twirly mustache and a fencing sword and a velvet cape as dark as his evil deeds), I ended up failing to use my timeboxes for more than a few weeks. Timeboxing works great for brainstorming and editing, or anything else that doesn’t have a definite end condition. But writing? You can say you’ll spend only 30 minutes drafting an aimed-for 600 word post, but the reality is that you’ll keep writing until you reach the end, whether or not you stayed in the timebox. Here is what a working fiction-writing process looks like: make an idea-mess, tame it into a summary sentence, expand that sentence into a more useful idea-mess, then write. After that you get to revise, and revision is where you sleight-of-hand your draft so that it looks like you knew what you were doing all along. 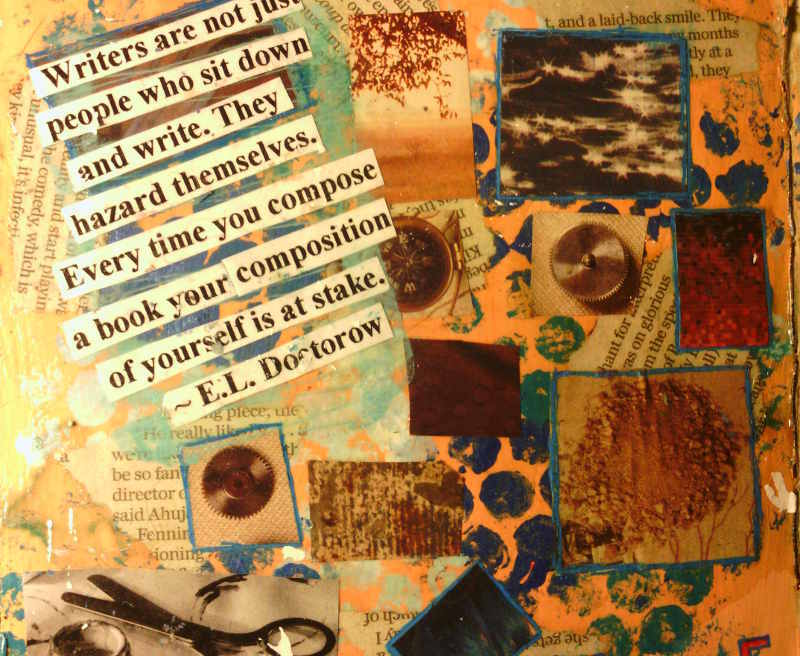 Not everyone writes that way, but I came by some of my process through the How to Think Sideways writing course (highly recommended, more so than my actual creative writing degree), so I know there are others out there. When I decided to fix my blogging process (which comes down to typing out mental narration), I turned to the How to Think Sideways lessons that had helped me so much. But I also ended up digging into the nuts and bolts of my own writing process. And after spending a few hours pacing and scribbling diagrams, I discovered the building blocks of all written matter. And that’s what Part II will be about. *I’ve written over 2000 words per hour in the past. I just didn’t enjoy them. **One is about my recently-deceased Chevy Prizm and the other is about why the phrase “Whatever doesn’t kill you makes you stronger” is a bunch of crap. I try to limit the number of rant-based posts I write, and so the latter may not see the shining light of the internet. ***My recently-deceased Chevy Prizm is smaller than a Subaru Forester, which I accuse of being a fat beast when it won’t go into a parking spot the way I want. ****This is way too many footnotes for one post, let alone one paragraph, and I’m going to have to start using superscript numerals instead of asterisks that, taken in a group of four, make it appear that I have some choice words I’m not using. But, rest assured, I would use them. In the years since I started cutting my own hair, I developed the skill of learning new skills. I know the ratio of reading to practice that works for me, and how much I need to observe and copy others until I can work on my own. And I know now that it would have been smart and efficient to watch a video of someone cutting hair. I could have done it seven years ago, and it would have saved me a lot of time. Help how do u cut ur own hair with layers I cant go to the salon plz thx??? Half the answers always say, “You can’t do it at home. Please get a professional to cut it or you’ll ruin your hair.” And there will maybe be one useful link. It’s long, but even after cutting my own hair this way numerous times in the past, I picked up some useful information. Also, some of the other videos I watched had double-fast sections with loud, irritating dance music that was maybe supposed to get me psyched about style and high fashion. It’s way more fun to hack away with a hair-cutting razor while listening to loud music than it is to methodically part your hair in seven sections and go about things in an orderly fashion. But like a drawing or a piece of writing, it’s best to start with the overall structure and then fill in the details. Have you ever tried to draw someone’s living room by starting with the weird 70s upholstery on the couch? And then the couch took up way too much space, so you couldn’t fit in the funky end table? And definitely look up hair-cutting razors. I find them easier to use on my own hair, and they’re a good way to add a lot of texture (although, as a friend told me when she cut my hair, everything adds texture). The downside is that you really have to be careful about making sure the blades are sharp, otherwise you end up with split ends** pretty soon after the haircut starts growing out. I’ve used this stainless steel Fromm Razor for nine years–it’s been an essential tool for most of my diy haircuts. The replacement blades are also cheap. It’s hard to get a good double-mirror set-up, especially if you’re a renter and have limited control over what you can do to your living space. Over the years, I’ve learned how to cut my hair by feel. Watching the youtube video confirmed that this wasn’t a bad strategy; the stylist frequently used hair cut to the desired length as a guide to cut the hair near it. That’s basically what I had taught myself to do by blindly. Better yet, don’t be near-sighted at all. I switched from contacts to glasses a few years ago. It’s tricky to cut around the ears now. 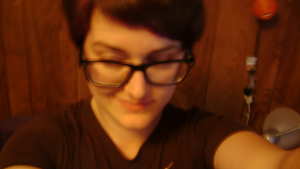 This is the sort of blurry, cut-off nonsense you get when you try to take a reference picture of yourself with a bulky tablet. Get someone else to take a picture, or better yet, multiple pictures. It’s the best way to decide what you like for next time, and also doubles as a neat memento of the super 70s wood paneling in your old apartment. If you’re using a picture as a reference, study it closely. Unless you have long hair (and therefore a lot of room for error), don’t just estimate what you’re cutting. Study how your own hair behaves, and where it has curls or cowlicks. How is your hair textured? Straight and fine is less forgiving to error than thick and wavy. Where does a particular chunk of hair start on your head, and what direction does it grow? Take pictures of your own hair. If you don’t like how your cut came out, figure out specifically why. I resisted this for a long time. But the fact is that there are a ridiculous number of photos of any given celebrity. It’s easy to find pictures of the same haircut from different angles. Also, I’ve been watching a lot of Once Upon a Time, so obviously I want Ginnifer Goodwin’s hair because Snow White is a badass. Inches aren’t that useful, except for when you need to use clippers. Anyone who’s ever asked for a one-inch trim and gotten a massacre knows that. I’ve found that inches aren’t useful in home haircuts either. References to ears, eyebrows, and jawline are more helpful. If you’re using reference pictures, look for where the hair falls in relation to those landmarks. I also suspect that using body parts as guides is a good way to make the haircut more harmonious and suited to your face. I didn’t start to get better at cutting my own hair until I’d been doing it for five years. That’s not because there was a five-year learning curve, but because I was afraid to go too short, so I never cut it the way I really wanted. After a professional cut my hair into a pixie, I wasn’t afraid anymore. I knew how I looked with very short hair, and I knew that if I ever messed up, I could go to the salon and have it fixed. *An A-Line Bob is a haircut, not some guy with a nickname that has a long, inside-joke type story behind it. **I didn’t understand what split ends actually were until I started cutting my own hair. Or, I understood what they were, but not why they were a problem. You know when you badly need a haircut, and the ends of your hair feel like prickly thatch? Split ends. Probably, this is not news to anyone else. We’re in the final days of The Caterpocalypse*. The caterpillars are basically all gone now, but their effects remain. All those leaves are caterpillar food. Maybe the childrens book The Very Hungry Caterpillar isn’t so cute after all. Comparing those bare trees to an apocalypse was kind of a dramatic thought. But then, it was a dramatic sight. During the weeks that this happened, I wasn’t online much, didn’t have many hours at either of my jobs, and didn’t really leave home a lot either. I hadn’t seen any news of the caterpillars at all. I was basically a writer-hermit, and it was a shock when I went to visit my parents and saw thick shag carpets of gypsy moth caterpillars trying to climb past barriers of cardboard and duct tape. It started with the noise: the sound of rain falling when there was no rain. My brother informed me that this was the sound of caterpillar crap falling from the trees. I didn’t totally believe him; in my head, I filed what he had said in the same space as urban legends. And yet, every time I heard that noise, I couldn’t shake what he’d said. It kind of made sense, and well, my car was covered with little black dots that had to have come from somewhere. The annoying and disgusting aspects of all this presented themselves first: caterpillar droppings, difficulty eating outdoors, lack of shade from the hot sun, rashes from the caterpillars. I cheered on my chickens as they cleared the caterpillars from the area surrounding their coop. They ate so many that they got tired of them. But the possible consequences of the situation occurred to me soon after. What if the leaves didn’t grow back? I told myself that it’s probably unlikely that we’d have a legitimate ecological apocalypse. But then, things like that do happen. My line of thinking basically boiled down to, “It can’t happen here.” But of course, it could. Right now, I’m reading The Tipping Point by Malcolm Gladwell. His discussion of social epidemics starts with a discussion of actual disease epidemics. What’s scary is that not a lot has to change for an existing disease to expand massively into an epidemic. I know caterpillars aren’t the same as diseases. There’s an entire ecology affecting their population. But maybe just some tiny change, in some coming year, would be enough to tip caterpillar leaf consumption from large areas of leaf cover to all the leaf cover. This year, a dry winter was apparently enough to inhibit the growth of a fungus that balances the caterpillar population. “Will the leaves grow back?” I asked my uncle, a gardener and former biology teacher, and therefore An Authority on the Subject. They would, he said, but it didn’t shake the unique sense of unease that comes from walking under winter branches on a 90 degree day. We’re in the final days of the Caterpocalypse. Sometimes, I drive through the bare areas and I see the spring leaves starting to pop in. It’s not as disorienting as bare branches, though it is definitely strange, and I assume there will be other consequences of this. There are a lot of moths out. *The main thing that inspired me to write this post was the fact that I hadn’t seen any news articles use the term “caterpocalypse,” which seemed like kind of a waste. It’s much less of a stretch than “snowmageddon” was, though it could look as though it’s referring to a tragedy involving a catered event.